Patrons enjoy the ambiance as well as the food and beverage offerings at Nourish Coffee Shop & Juice Bar in the Market at Liberty Place on West State Street. The Belgian Tripel infused with local redbuds and the West Coast-style IPA samples from the not-even-open-yet Kennett Brewing Company told the story at the grand opening of the Market at Liberty Place in Kennett Square: They disappeared quickly. 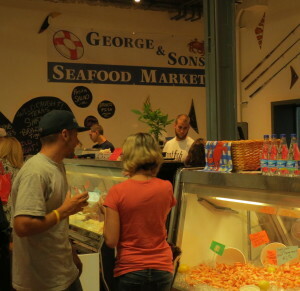 Despite persistent rains, crowds packed the borough’s newest retail space: a food-court style venue at 148 West Market Street that houses George & Sons Seafood, Nourish Coffee Shop & Juice Bar, Paradocx Vineyards, Rick’s Steaks, State Street Pizza and Grill, and Yo’r So Sweet Crepes. “Things are good,” said Borough Manager Brant Kucera as he surveyed the throngs of visitors, many of whom expect to be repeat customers. He said instead of discouraging people from venturing out, the rain seemed to have the opposite effect. An inviting display of fresh and prepared seafood choices greeted visitors to George & Sons Seafood in the Market at Liberty Place. Once inside, patrons, entertained by music from Sin City Lite, could wander from business to business, sample and purchase food and drink, and chat with friends and neighbors. Hillary Holland agreed. “I’m excited about having all these restaurants close by,” she said. “The crepes are great,” exclaimed 8-year-old Veronika Brien of West Grove. Her sister, Sydney, 11, favored the “amazing” cheesesteaks at Rick’s Steaks. “The staff is very nice, too,” she added. Their mother, Carla Brien, said that because her parents live in the borough, the family visits frequently from West Grove. “We’ll be here again,” she predicted. That kind of response thrilled the merchants. While most will be permanent fixtures, the brewing company is destined for 109 S. Broad St. later this year. Mark Osborne, one of the four owners, said they just wanted to let people know they’re coming. He said samples of nearly nine gallons of beer lasted a little over an hour. “We hope to stay in people’s minds,” he said. 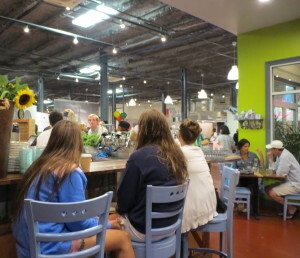 Francine Covelli, one of the owners of the Nourish Coffee Shop & Juice Bar, said she was thrilled with the reception, especially after devoting time to constructing the space with reclaimed and recycled materials, ranging from barn wood to copper to planking from a porch in Avalon, N.J.